Scott Nolen (arms in air), Mayor Jonathan Rothschild, Michelle Nolen Senner, Justin Bellet and other company executives celebrate as the ribbon is cut. On Feb. 24 — Founder Truly David Nolen’s 88th birthday — approximately 100 invited guests were on hand to watch Tucson, Ariz., Mayor Jonathan Rothschild assist Truly Nolen executives in a ribbon-cutting. The ceremony was part of the grand opening of the brand-new, 12,000-sq.-ft.-plus Truly Nolen Leadership Center at 434 S. Williams Blvd. 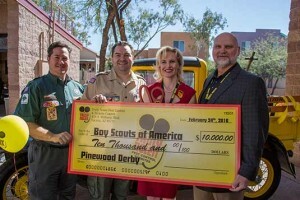 The ceremony also included a $10,000 donation to the Boy Scouts of America Catalina Council to be the title sponsor of the September 2016 Pinewood Derby, an annual Boy Scout event. Speakers at the event included Mayor Rothschild, Congresswoman Martha McSally’s representative Nancy Heiser — as McSally was in Washington, D.C. for a meeting — Truly Nolen CEO/President Scott Nolen, Truly Nolen Executive Vice President Greg Weatherly and Truly Nolen Director of Marketing and Philanthropy Michelle Nolen Senner. An exterior view of the newly opened Truly Nolen Leadership Center. 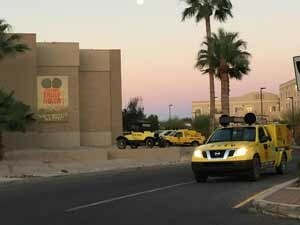 Previously, the company’s training department and classroom settings for the West were based in Phoenix; however, with corporate headquarters in Tucson for more than 60 years, the company wanted to extend its presence in the local community. Bill Lake-Wright and Sam Alboy of the Tucson Boy Scouts of America accept the $10,000 Pinewood Derby title sponsor donation from Michelle Nolen Senner and Greg Weatherly. Following the ribbon-cutting, guests toured the Leadership Center, which includes a courtyard and stadium seating, full-functioning commercial kitchen, garage-style cookout area, auditorium space for classes, a mock home setup designed to replicate almost any possible pest scenario for training purposes and a “Bug Room” for both employees and the public to explore. This room, complete with live insects in displays along with a pest identifier section, will be used by team members, professionals in supportive industries and even youth in classrooms. Earlier that week, Mesa Verde Elementary second-graders became the first to experience the unique “Bug Room” environment.